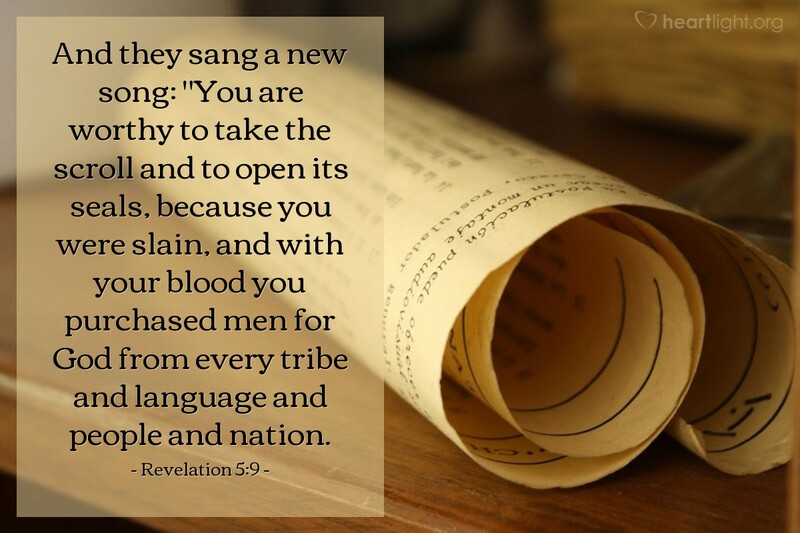 And they sang a new song: "You are worthy to take the scroll and to open its seals, because you were slain, and with your blood you purchased men for God from every tribe and language and people and nation. Worthy! What a beautiful word! For those of us who are disciples of Jesus, we know of only one who is truly worthy. He is worthy to open the scroll and reveal the future. He is worthy of praise and adoration. Why? Because even though he was holy, perfect and heavenly, his death on the cross to purchase our pardon, forgiveness, and salvation made him worthy. And he did it not just for us, but also for people of all races and languages and cultures. Jesus, you are worthy! Holy Lamb of God, you are worthy! You are worthy of my adoration and love. You are worthy of my worship and my devotion. And Holy Father, I thank you for your plan to send him to save me. Because of your grace in Jesus, I want to live my life in devotion to you and your will. Please forgive me for the times I've gotten side tracked. Thank you for giving me the opportunity to return to you. In the name of Jesus, your holy Lamb slain for my sins, I offer my love and thanks. Amen.